The Academy Awaird for Best Actor is an awaird presentit annually bi the Academy of Motion Picture Arts and Sciences (AMPAS). It is gien in honour o an actor wha haes delivered an ootstaundin performance in a leadin role while wirkin within the film industry. In the follaein table, the years are leetit as per Academy convention, an generally correspond tae the year o film release in Los Angeles Coonty; the ceremonies are always held the follaein year. For the first five ceremonies, the eligibility period spanned twal months frae August 1 tae Julie 31. For the 6t ceremony held in 1934, the eligibility period lastit frae August 1, 1932 tae December 31, 1933. Syne the 7t ceremony held in 1935, the period o eligibility acame the full previous calendar year frae Januar 1 tae December 31. 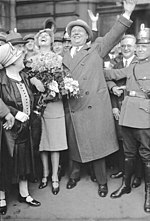 Emil Jannings (center) wis the first winner in this category for his roles in 1928's The Last Command an 1927's The Way of All Flesh. Warner Baxter wan in 1928 for his performance in In Old Arizona. George Arliss wan in 1929 for his performance in Disraeli. Lionel Barrymore wan in 1930 for his performance in A Free Soul. Wallace Beery (tap) an Fredric March (bottom) tied in 1932 for their performances in The Champ an Dr. Jekyll and Mr. Hyde, respectively. March would an aa win in 1946 for The Best Years of Our Lives. Clark Gable wan in 1934 for his performance in It Happened One Night. 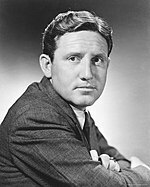 Spencer Tracy wis the first actor tae win this category twa consecutive years, haein wan in baith 1937 and 1938 for his roles in Captains Courageous an Boys Town includin seiven ither nominations. Bing Crosby wan in 1944 for his performance in Going My Way. Laurence Olivier wan in 1948 for his role as the teetle chairacter in Hamlet, a film which he himsel directit. Marlon Brando wan twace frae seiven nominations for his roles in 1954's On the Waterfront an 1972's The Godfather. 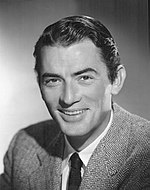 Gregory Peck wan in 1962 for his performance in To Kill a Mockingbird. Sidney Poitier wan in 1963 for his performance in Lilies of the Field, sicweys acomin the first black actor tae win an Oscar. Jack Nicholson wan twace frae aicht nominations for his performances in 1975's One Flew Over the Cuckoo's Nest an 1997's As Good as It Gets. Dustin Hoffman wan twice frae seiven nominations for his performances in Kramer vs. Kramer (1979) an Rain Man (1988). Robert De Niro wan ance frae five nominations for his role as Jake LaMotta in 1980's Raging Bull. Ben Kingsley wan for his portrayal of the teetle role in Gandhi (1982). Michael Douglas wan in 1987 for his performance in Wall Street. Daniel Day-Lewis is the first actor tae win this awaird three times, in 1989, 2007, an 2012, for his performances in My Left Foot, There Will Be Blood an Lincoln respectively. 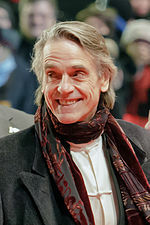 Jeremy Irons wan for his portrayal o Claus von Bülow in 1990's Reversal of Fortune. 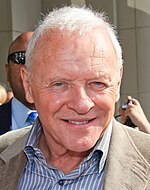 Anthony Hopkins wan ance frae three nominations for his role as Dr. Hannibal Lecter in 1991's The Silence of the Lambs. 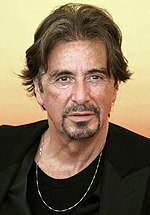 Al Pacino wan ance frae five nominations for his performance in 1992's Scent of a Woman. Tom Hanks wan twa consecutive awairds in 1993 an 1994 for his roles in Philadelphia an Forrest Gump includin three ither nominations. Bi virtue o his win in 1998 for Life Is Beautiful, Roberto Benigni acame the seicont actor tae win for a role in a film he directit himsel. Russell Crowe wan ance frae three consecutive nominations for playin Maximus Decimus Meridius in Gladiator (2000). Denzel Washington wan ance frae fower nominations for his role in 2001's Training Day. 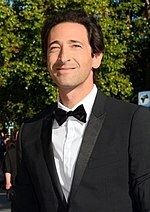 At age 29, Adrien Brody acame the youngest winner for Best Actor for his performance in 2002's The Pianist. Sean Penn wan twice frae five nominations for his roles in 2003's Mystic River an 2008's Milk. Philip Seymour Hoffman wan for Capote (2005). Forest Whitaker wan for his performance as Idi Amin in the 2006 film, The Last King of Scotland. Jeff Bridges wan ance frae three nominations, twa bein consecutive, for his performance in 2009's Crazy Heart. Colin Firth wan ance frae twa consecutive nominations for his portrayal o Keeng George VI in 2010's The King's Speech. Jean Dujardin bacame the first French actor tae win this awaird for his performance in the 2011 film The Artist. Matthew McConaughey wan in 2013 for his performance as Ron Woodroof in Dallas Buyers Club. Eddie Redmayne wan in 2014 for his role as Stephen Hawking in The Theory of Everything, an wis nominatit the next year for his performance as Lili Elbe in The Danish Girl. Leonardo DiCaprio wis nominatit for The Aviator, Blood Diamond, an The Wolf of Wall Street, afore winnin in 2016 for his portrayal o Hugh Glass in The Revenant. Crowe !Russell Crowe Beautiful !A Beautiful Mind Nash !John Forbes Nash Jr.
Cooper !Bradley Cooper Silver Linings Playbook Solitano !Patrizio "Pat" Solitano Jr.
↑ Patel, Tara (February 27, 2012). "'The Artist' Wins Top Oscar Honors in Bow to Silent Film". Bloomberg Businessweek. Bloomberg L.P. Archived frae the oreeginal on August 28, 2012. Retrieved May 9, 2013. ↑ "The 2nd Academy Awards Nominees and Winners". Academy of Motion Picture Arts and Sciences (AMPAS). Retrieved August 27, 2013. ↑ "The 3rd Academy Awards (1930) Nominees and Winners". Academy of Motion Picture Arts and Sciences (AMPAS). Retrieved August 27, 2013. ↑ "The 4th Academy Awards (1931) Nominees and Winners". Academy of Motion Picture Arts and Sciences (AMPAS). Retrieved August 27, 2013. ↑ "The 5th Academy Awards (1932) Nominees and Winners". Academy of Motion Picture Arts and Sciences (AMPAS). Retrieved August 27, 2013. ↑ "The 6th Academy Awards (1933) Nominees and Winners". Academy of Motion Picture Arts and Sciences (AMPAS). Retrieved August 27, 2013. ↑ Barnes, Brooks (2018). "2018 Oscar Nominations: 'The Shape of Water' Leads With 13 Nominations". The New York Times (in Inglis). ISSN 0362-4331. Retrieved 2018-01-23. This page wis last eeditit on 7 Mairch 2018, at 02:22.